In a time of reactionary political correctness and extreme, self-important voices on both sides of the ideological aisle, leave it to Trey Parker and Matt Stone (of South Park fame) to fearlessly cut through the crap and call things like they are. If you’ve seen South Park: Bigger, Longer and Uncut, you’ll have a very good idea what to expect from Team America: World Police. The main difference this time is that, rather than using deliberately bad looking animation, Trey and Matt here endeavor to offend half the planet with Gerry Anderson-style puppets on strings. The story is driven by North Korean nut-job/president Kim Jong-Il, who is supplying terrorists with weapons of mass destruction as part of a secret plan to plunge the planet into Third World chaos. Working to stop the terrorists is Team America, a Thunderbirds-like strike and rescue team headquartered deep inside Mount Rushmore. Their plan is to infiltrate the terrorists’ organization and foil the plot... but they’ll need the talent of the world’s best actor, Gary Johnston, to do it. Once Gary’s on board with the plan, Team America will spare no amount of bullets, missiles, explosives and cowboy gusto to prevent a disaster the likes of 9/11 times a hundred. 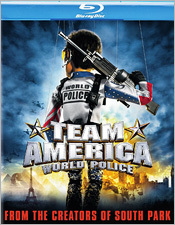 One of the things that makes Team America work so well, is that it takes its absurd premise completely seriously. Better still, no one is spared from Parker and Stone’s savage wit. Liberals, conservatives, terrorists, French people... all are made to look foolish here, which is as it should be. Team America is quick to shoot first and ask questions later, and quick to wave the flag to rally the cause, even when they’ve just blown up half of a foreign city to kill the bad guys. (Hey – it’s a lousy job but who else is going to do it?) Anyone who isn’t with Team America is against Team America, if you get the drift. Particularly scorned in this film are self-important Hollywood actors (like Alec Baldwin, George Clooney, Tim Robbins, and Sean Penn) who spout their political opinions at inappropriate times and unwittingly play right into Kim Jong-Il’s plans. They’re scorned not so much for being liberal, but as Parker notes in one of the featurettes on the disc, “No matter how big or small the actor, they all have such an attitude and think that they’re all rad. There’s no lamer thing you can be in the world than an actor.” Sometimes, it’s hard to disagree. But the boys don’t stop there. Hell, even director Michael Bay gets boned pretty good here. By the way, if you’ve gotten the sense that you might be offended by the profanity in this film... then yes, you probably will. Best to pass on this one. This wouldn’t be a Trey Parker and Matt Stone production if the boys didn’t try to push things well past the limits of good taste in an effort to piss of the MPAA. Bless their disgusting little hearts for it. For the rest of you, let’s move on to the disc itself. As you may know, Warner Home Video has licensed many Paramount deep catalog films for release on Blu-ray, and this film is no exception. Warner’s BD includes the film in good 2.40:1 widescreen HD video. The image is a little soft from time to time, but detail is generally solid. Colors are accurate, though occasionally a little more subdued than you might expect. Contrast is fine, with deep blacks. This is a decent Blu-ray image, but it’s not what you would call reference quality. On the other hand, the sound is terrific. The film’s original English soundtrack has been included in a 5.1 DTS-HD Master Audio mix that’s incredibly active and dynamic. The surround channels are lively, and there’s active panning and thunderous bass. The movie really does sound fantastic here. In addition to DTS-HD, you also get Dolby Digital 5.1 options in German, Spanish, Latin Spanish, French, Italian, Japanese, and Portuguese. There’s also a huge array of subtitle options, including English SDH and many, many more. So that’s the good news. If you’re thin-skinned, quick to take offense, or an actor, just stay the hell away from this film. It’s best not to go there. On the other hand, if you’re sick of political blow-hards and PC hyper-correctness, and looking for some good laughs (sometimes even at the expense of your own beliefs), Team America is for you. The film was an instant cult classic when it was first released back in 2004, and it’s only gotten funnier and more relevant with age. The lack of effort on display in this Blu-ray is disappointing, but the A/V quality is fine… and at least it’s cheap.